Electromyography (EMG) determines electrical activity or muscle response in reaction to a nerve’s stimulation of the muscle. Neuromuscular abnormalities can be identified by applying EMG which assists in the identification process. During the test, one or more small electrodes (also known by needles) are introduced through the skin into the muscle. The electrical activity picked up by the electrodes is then showed on a monitor that exhibits the same electrical activity in the form of waves. An audio-amplifier is employed to hear the activity. EMG measures the electrical activity of muscle during forceful contraction, slight contraction and rest. Muscle tissues do not usually produce electrical signals while resting. When an electrode is inserted, a short period of activity can be observed on the display monitor (oscilloscope), but no signal should be present after that. After an electrode has been inserted, one is asked to contract the muscles, for example, by bending or lifting the leg. The action potential that is generated on the oscilloscope delivers report about the capability of the muscle to retort when the nerves are stimulated. More and more muscle fibers get activated, when the muscles are contracted more forcefully, producing action potentials. Electromyography devices market is anticipated to record a significant CAGR over the forecast period. Growing awareness about psychological and physiological health among the population is anticipated to lead to faster growth of the electromyography devices market. Electromyography devices are estimated to display strong growth over the forecast period because it is a non-invasive technique with no health risks linked with it. It has been proven that electromyography devices involved in therapy improve symptoms of migraine and headache in approximately 40 to 60 percent of patients. Patients affected by the nerve injury, bruxism, cerebrovascular accident, torticollis, poliomyelitis, temporomandibular joint syndrome, and others are treated using electromyography devices. 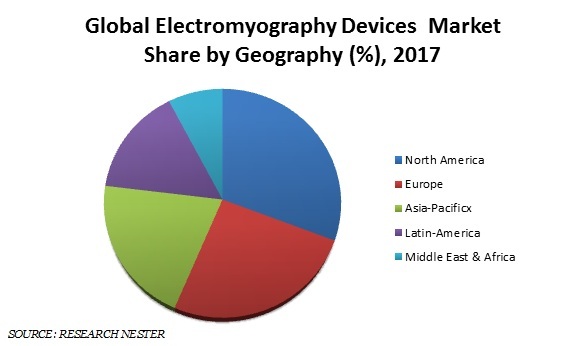 On the basis of regional platform, global electromyography devices market is segmented into five major regions including North America, Europe, Asia Pacific, Latin America and Middle East & Africa region. Due to increase in the demand for the muscle monitoring devices and growing awareness, North America dominates in electromyography devices market globally. The preference of non-drug treatment by patients is estimated to continue its authority in the coming years. North America’s well-built healthcare infrastructure along to address the growing prevalence of neural diseases is expected to behave as the major factors in the EMG market growth. Europe follows North-America in electromyography market owing to the easy access to advanced technologies. The electromyography devices market is chiefly propelled by the increasing R&D activities taken up by the market players to improve their product portfolio along with the increasing prevalence of neural diseases in the present generation. There has been an increase incidence of neurodegenerative disorders especially in the geriatric population such as Alzheimer's and Parkinson's disease that is anticipated to drive the electromyography devices market. Growing awareness about overall physiological health among the modern population is moreover predicted to aid in the EMG devices market growth. Cumulative mergers and acquisitions and speedy product launches between government associations and manufacturing companies are further expected to aid the electromyography devices market expand at a rapid rate across the world. 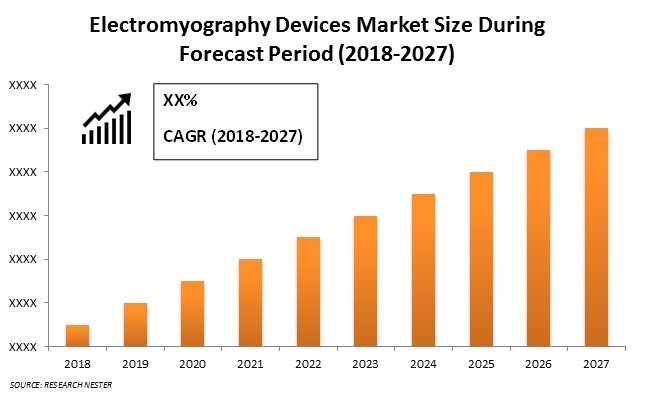 However, certain aspects such as lack of skilled professionals and the low government funding could hamper the growth of electromyography devices market.